Possibly one of the most frequent questions I get as an author is: Where does your inspiration come from? The answer: From everything, and everybody, everywhere. An example of this is from a recent trip to NYC’s Metropolitan Museum of Art. 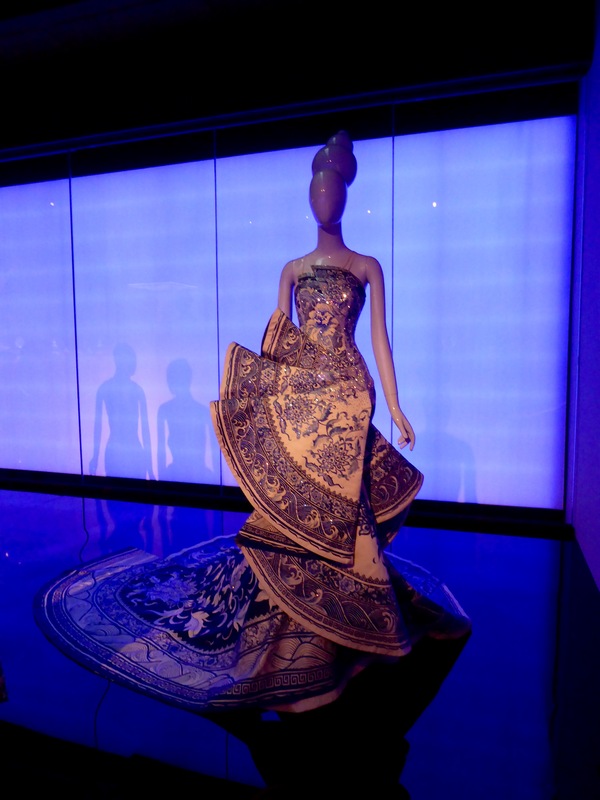 The fantastic exhibit, China Through the Looking Glass, had all the hamster-wheels in my brain running at full speed. 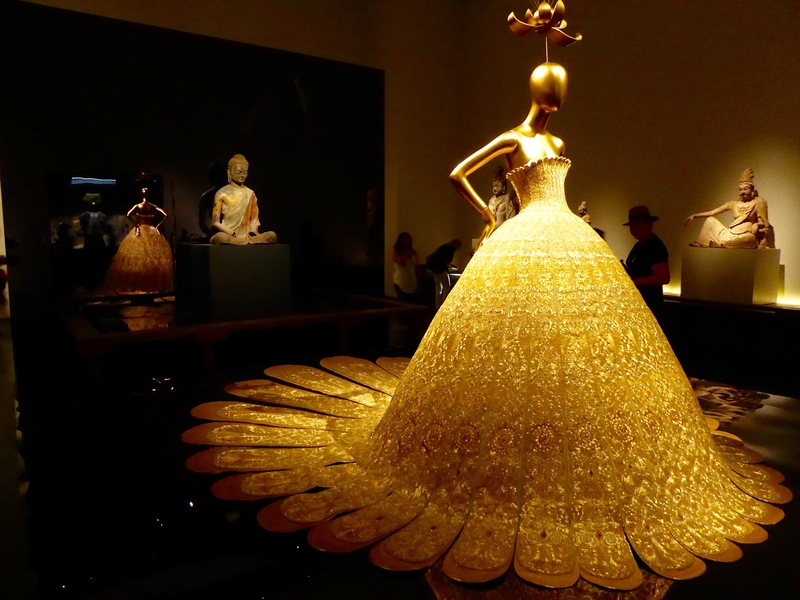 In possibly the world’s best curated exhibit, the amazing Met staff arranged clothing that had been inspired by Chinese art, not in a separate clothing exhibit, but right in the midst of their Chinese art section. 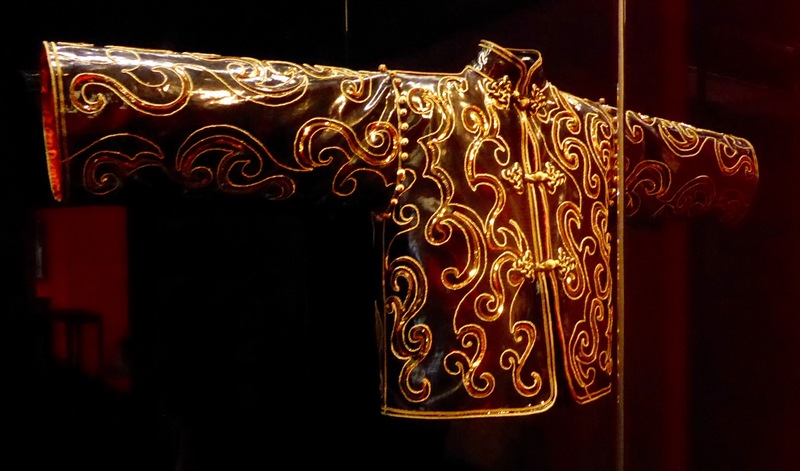 Visitors could see how a lacquer screen influenced a dress, how decorative items guided the bottle for Opium perfume, or how the flutter of fans were reflected in the flounce of a ballgown. It had my little noggin smoking, too. Look at the gold number above. What could you hide underneath that skirt? What are the observant statues thinking? One Buddha reclines seductively, the other looks down as if guarding his own secret. Are they enemies or friends as the beautiful spy negotiates the party? Could the flounces of this dress be hiding tools to break into a safe? Or gear to climb out a four story window? And this jacket appears to be practically bullet proof already. Do these long sleeves hide guns or maybe a knife? And among the bustle and hustle of tourists of every description what information is being traded, who is being followed, and who disappears into the crowd? Hopefully you’ll see some of these threads weave into stories with the release of my book, The Spy in the Mirror, next year. Until then, perhaps your imagination will run as wild as mine.